Rec Room left outside · Exploring Microservices — Game On! 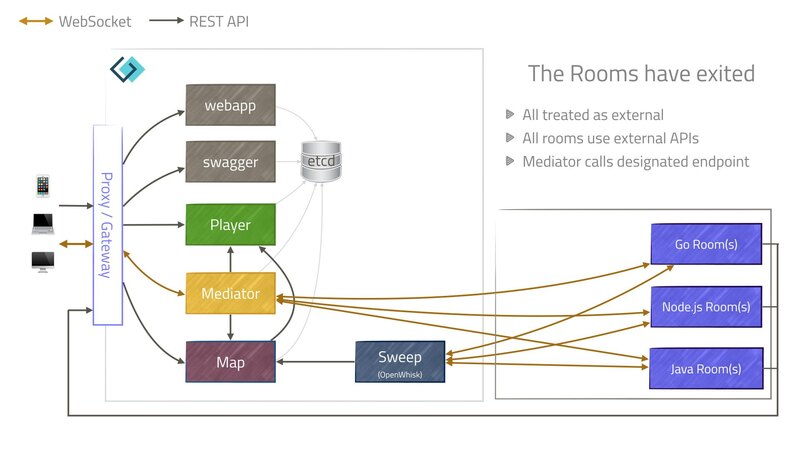 As user-created rooms were added to the Map, we started thinking about treating our rooms like everybody else’s. Up until this point, our rooms have cheated (a little), as they’ve been able to directly talk to the core services. But no more! For we have kicked the rooms out of the core services club, and told them they can no longer be members. As with all recent &apos;exit&apos; attempts, this one leaves the rooms still with the odd toe in the core services pond, mumbling something about freedom of movement, and the fact we can’t quite yet bring ourselves to require yet another batch file to handle the launching of rooms. Conceptually however, they are now very much split off. We hope they enjoy their banishment and that they do not decide to rise up against us.